Recycled Plastic Mats Manufacturing Process - information for people who care! Our Recycled Plastic Mats are designed by genuine artists and manufactured in a process that uses discarded plastic waste. 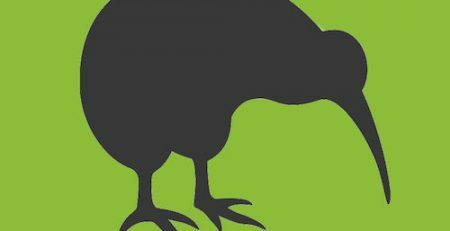 A great learning tool for early child care centres (kindergartens, playcentres, day cares, etc), schools, Kapa Haka groups, Kohanga Reo and community groups, or even just everyday people who love the outdoors and care about Mother Earth. 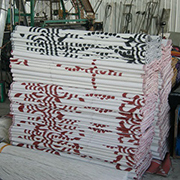 These artists are are hired/commissioned to create the designs that you see on our mat collection. Each of the designs in our Cultural Recycled Plastic Mat collection can be translated into a story that has meaning. 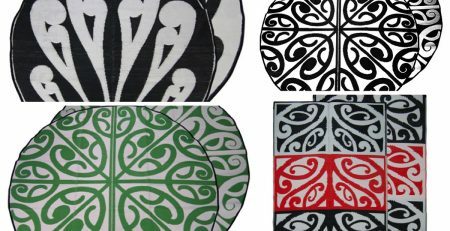 Recycled Mats only works with designers who are from the culture and/or background that is specific to each of their designs. For information on the artists hired/commissioned for our Cultural Collection, please click here. 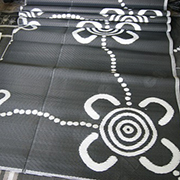 The designing of each of the mats in our cultural range can take from a few days to a few months. It all depends on the individual designer, the detail of their design involved while ensuring the story and meaning is correct. 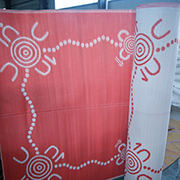 All mat designed are sent approval sought from the relevant tribe, region and/or community. 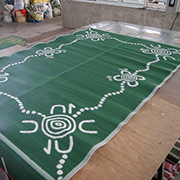 One mat mat took 18 months to complete and highlights the genuine involvement in the process. 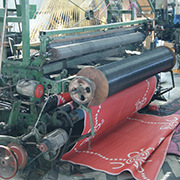 Once the design has been signed off and approved, a sample mat is created in one of the approved factories in Asia to ensure that the concept and design actually translates well into a mat. Upon approval of the sample mat, the below manufacturing process begins. 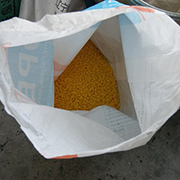 Many various types of recycled polypropylene plastic materials are collected and melted down. 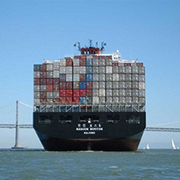 This polypropylene plastic includes the polymer found in many household and industrial products. These include medicine bottles, single use shopping bags, drink bottles, carpet fibres, to name a few. It is very slow to degrade in the landfill but can be melted down for recycling into other products. 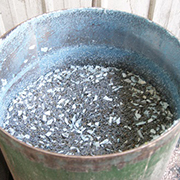 The melted plastic is cooled in a pellet shape. While the cooling is occurring while the moulds/templates for the mats are created. The pellets of recycled plastic and polypropylene are then mixed with various colours to create the desired tone that matches the design. 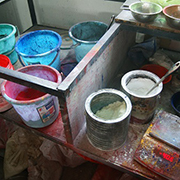 These colours will then become the base colour for the mats creation. The pellets and colour are then remelted to form the coloured liquid of the plastic straw (or tube) that is used to weave each Recycled Plastic Mat. The liquid then gets fed through a tube which is pushed through a pool of water. This water cools the hot plastic as it passes through and allows the plastic to be formed into the straws/tubes that you see in the finished product. As part of the quality control process, all recycled plastic straws/tubes are checked for colour and thickness. 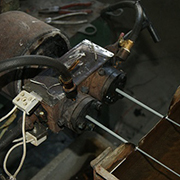 The approved straws/tubes are then taken to machines where and are placed in several slots. 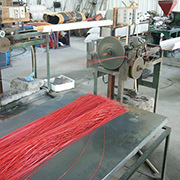 The machine then picks up these straws/tubes to weave the mats. Every one of the unique mat designs has it’s own specific “mould” which tells the machine what the design looks like. 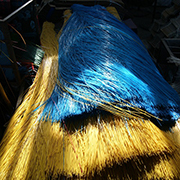 It also confirms how many colours are to be used in the weaving process. 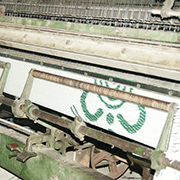 Once the mould has been loaded onto the machines, then the highly manual mat weaving process begins. Every machine is overseen by a dedicated factory staff members during the entire weaving process. Their job ensures that each loop is thread into the loom at the correct time and place. Once the mats are woven they go onto a and oversized roll which holds approx. 200 mats at a time. Each roll is taken to the tables where hot irons are used to cut and seal the ends. Each of the our Recycled Plastic Mats then have a black seal sewn around the outside to ensure they stay rigid when laying flat. This also assists in preventing fraying along the cut edge. ensure that it meets the standards set. The approved finished product is then packed ready for uploading into shipping container and sent to Australia where they are checked once again. 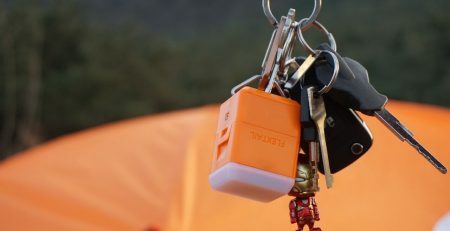 They are then repacked and sent Lifestyle Gear in New Zealand for a market which includes everyday families who love the outdoors, early child care centres (kindergartens, playcentres, day cares, etc), schools, Kapa Haka groups, Kohanga Reo and community groups just to name a few. To check out the full range of Recycled Plastic Mats – click here.